The TWG coding standards committee is announcing an issue for final discussion. Feedback will be reviewed on March 20, 2019. To help the initiative to update all deprecated code for Drupal 9 we need a standardized format for deprecation messages. Issue #3024461: Adopt consistent format for deprecation messages. Having a machine readable format for deprecation messages will allow us to develop tools on api.drupal.org to keep track of the current status of deprecated code in Drupal core and contributed modules. This will help drive the initiative to update all deprecated code before the release of Drupal 9. You can get started quickly by helping us to update an issue summary or two or dive in and check out the full list of open proposals and see if there's anything you'd like to champion! Developers and site owners can begin testing the alpha after its release. The 8.8.x branch of core will be created, and future feature and API additions will be targeted against that branch instead of 8.7.x. All outstanding issues filed against 8.7.x will be automatically migrated to 8.8. All issues filed against 8.6.x will then be migrated to 8.7.x, and subsequent bug reports should be targeted against the 8.7.x branch. Most issues that are allowed for patch releases will be committed to 8.7.x and 8.8.x. Most issues that are only allowed in minor releases will be committed to 8.8.x only. A few strategic issues may be backported to 8.7.x, but only at committer discretion after the issue is fixed in 8.8.x (so leave them set to 8.8.x unless you are a committer), and only up until the beta deadline. Roughly two weeks after the alpha release, the first beta release will be created. All the restrictions of the alpha release apply to beta releases as well. The release of the first beta is a firm deadline for all feature and API additions. Even if an issue is pending in the Reviewed & Tested by the Community (RTBC) queue when the commit freeze for the beta begins, it will be committed to the next minor release only. The release candidate phase will begin the week of April 15, and we will post further details at that time. See the summarized key dates in the release cycle, allowed changes during the Drupal 8 release cycle, and Drupal 8 backwards compatibility and internal API policy for more information. Since September 2018, we have been providing security coverage for the previous minor release as well as the newest minor release. So, in accordance with our policy, security releases for Drupal 8.6.x will be made available until December 4, 2019 when Drupal 8.8.0 is released. Bugfixes that are not security-related will only be committed until Drupal 8.6.x's final bugfix window on April 3. Normal bugfix support for Drupal 8.5.x ended in August 2016. 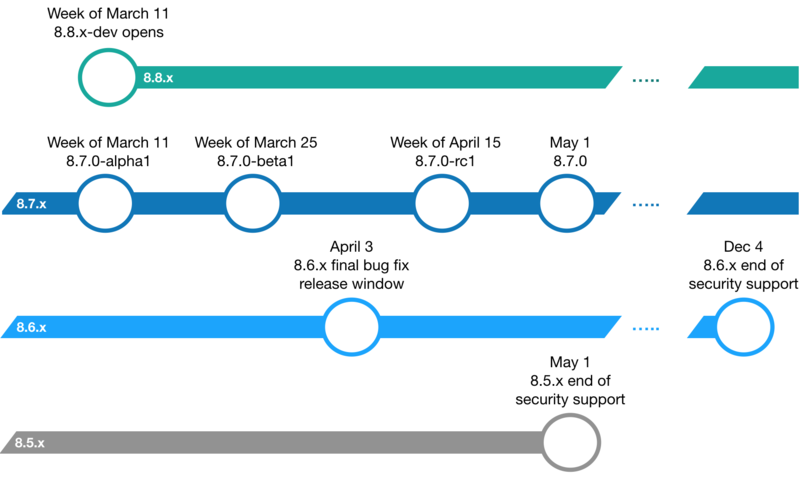 However security support is provided for 8.5.x until the release of Drupal 8.7.0 on May 1, 2019. Over the past five years, to meet the growing velocity in Drupal 8 core development and facilitate a more mature release process, we've gradually grown the Drupal 8 core committer team from two people to four, then six, then twelve people. We've reached a team size where we'd benefit from additional team members whose primary focus is helping the committer team function more effectively, through facilitating process; communicating with other maintainers, initiative teams, and the community; and organizing meetings and discussions. A committer team facilitator role, responsible for helping organize and run committer discussions. The committer team facilitator supports the committer team in the team's priorities (but does not set these priorities). This important project management assistance will allow the core committer team to spend more time reviewing and committing patches, which will increase the quality and speed of improvements. A core initiative facilitator role, responsible for supporting core initiative teams across initiatives and helping initiative coordinators. This is a very important role because it helps initiative teams to deliver software that meets end user needs and brings better community awareness to the efforts going on within initiatives. Both roles are estimated to be a 10-15 hour/month commitment, and we're suggesting a renewable one year term for each. Adding project management backing to the team will help us be more effective, and to better focus on those roles and tasks that only committers can do. I'm excited about this direction, as it embodies our principle of everyone has something to contribute, valuing non-technical contributions at the same level as technical contributions by making these roles a formal part of the committer team. If you're interested in one or both of these new roles, please get in touch! The TWG coding standards committee is announcing two issues for final discussion. Feedback will be reviewed on 11/13/2018. Drupal 7.61 - the next planned minor release of Drupal 7 - is scheduled for Wednesday, November 7th, 2018. Minor releases include new features, usability improvements, and backwards-compatible API improvements. now always passed the correct file URI. - Allowed the + character to appear in usernames. - PHP 7.2: Fixed Archive_Tar incompatibility. - PHP 7.2: Removed deprecated function each(). - PHP 7.2: Avoid count() calls on uncountable variables. - PHP 7.2: Removed deprecated create_function() call. - PHP 7.2: Make sure variables are arrays in theme_links(). At core committer discretion important bug fixes might be added prior to release and this post will be updated to inform of further changes. Drupal 8.6.x is now in a beta phase, which means we will now undertake disruptive cleanup tasks like adjusting coding standards. The main standards change in this release cycle will be the adoption of Prettier code formatter. Work is underway to patch core for this change, which will touch many files, so be aware that you will need to reroll patches for conflicts and adjust them to use the new code style rules set by Prettier by running yarn prettier. Developers and site owners can begin testing the alpha next week. The 8.7.x branch of core has been created, and future feature and API additions will be targeted against that branch instead of 8.6.x. All outstanding issues filed against 8.6.x will be automatically migrated to 8.7. All issues filed against 8.5.x will then be migrated to 8.6.x, and subsequent bug reports should be targeted against the 8.6.x branch. Most issues that are allowed for patch releases will be committed to 8.6.x and 8.7.x. Most issues that are only allowed in minor releases will be committed to 8.7.x only. A few strategic issues may be backported to 8.7.x, but only at committer discretion after the issue is fixed in 8.7.x (so leave them set to 8.7.x unless you are a committer), and only up until the beta deadline. The release candidate phase will begin the week of August 13, and we will post further details at that time. See the summarized key dates in the release cycle, allowed changes during the Drupal 8 release cycle, and Drupal 8 backwards compatibility and internal API policy for more information. I'm pleased to announce that Pol Dellaiera has accepted our invitation to be a provisional Drupal 7 core maintainer. Pol is based in Belgium and has been working in the Drupal community for 13 years. He is working at the European Commission and is on the core team of the OpenEuropa Drupal 8 project. After being tasked to write a new theme that was going to be the base for all current and future Drupal 7 sites at European Commission, Pol wrote Atomium and Registry on steroids -- two of his last contributions. Like many, Pol believes there is still so much good in Drupal 7 and is passionate about keeping it alive and healthy. You can read more about his background and thoughts on his blog. Please join me in welcoming Pol as a provisional Drupal 7 core maintainer. Various media outlets are reporting that a large number of Drupal sites are still vulnerable to the recent highly critical core vulnerabilities SA-CORE-2018-002 and SA-CORE-2018-004. Those reports are all based on the same source. The source investigated the contents of CHANGELOG.txt of a large number of sites and assumed all sites reporting a version lower than 7.58 to be vulnerable. Checking the contents of CHANGELOG.txt is not a valid way to determine whether a site is vulnerable to any given attack vector. Patches distributed by the Drupal security team to fix the issues were widely used, but did not touch CHANGELOG.txt or any version strings defined elsewhere. There are also other mitigations that vendors have provided which would also not affect CHANGELOG.txt but would protect the site. We believe the presented numbers to be inaccurate. We consider it to be misleading to draw conclusions from this sparse information. The Drupal project has a long history of a reliable coordinated disclosure security program. For the past 4 years, the Drupal Security Team has provided support to journalists covering our releases and policies and is available for further enquiries. If you are a member of the press and want the Drupal Security Team to comment, please contact [email protected]. Maybe you have seen Dries Buytaert's DrupalCon keynote and are looking forward to all the goodies coming in future Drupal 8 versions. The truth is none of those things will happen without people who want to make them happen to solve their own challenges with implementing and showcasing Drupal solutions. Are you implementing decoupled solutions and have issues you are working on? In the middle of building up a suite of integrated media solutions? These core team meetings are ideal to bring in these issues and discuss solutions and to be part of shaping up where Drupal 8 is heading. Read on for details. There is a weekly meeting on all API first work (REST, Waterwheel, JSON API, GraphQL) every Monday 2pm UTC on Google Hangouts. A link to the current hangout is posted 5 minutes before the meeting in the #drupal-wscci IRC channel. The Out of the box/demo team also meets every Monday at 3pm UTC on Google Hangouts. The Layout Initiative meeting is on every Tuesday at 5pm UTC in https://drupal.slack.com/archives/layouts, get an invite at http://drupalslack.herokuapp.com/. The usability meeting is every week at 7:30pm UTC on Tuesday at https://drupal.slack.com/archives/ux, get an invite at http://drupalslack.herokuapp.com/. There is a media meeting every Wednesday at 2pm UTC, join at https://drupal.slack.com/archives/media, get an invite at http://drupalslack.herokuapp.com/. Wanna help with migrate? The team either meets in Google Hangouts or the #drupal-migrate IRC channel. (Discussed at the start of the meeting based on lead availability in IRC). Meetings are on Thursdays 9pm UTC and 2pm UTC on a weekly alternating basis. DrupalCon Nashville includes a full track of core conversations where you can learn about current topics in Drupal core development, and a week of sprints where you can participate in shaping Drupal's future. How many sites are likely affected? How dangerous is this issue? Drupal security advisories include a risk score based on the NIST Common Misuse Scoring System. This helps give an objective sense of the risk of different issues. The risk of SA-CORE-2018-002 is scored 24/25 (Highly Critical) AC:None/A:None/CI:All/II:All/E:Exploit/TD:Default. How difficult is it for the attacker to leverage the vulnerability? None (user visits page). What privilege level is required for an exploit to be successful? None (all/anonymous users). Does this vulnerability cause non-public data to be accessible? All non-public data is accessible. Can this exploit allow system data (or data handled by the system) to be compromised? All data can be modified or deleted. Does a known exploit exist? Exploit exists (documented or deployed exploit code already in the wild). What percentage of users are affected? Default or common module configurations are exploitable, but a config change can disable the exploit. Note on the last point that while a configuration change can theoretically mitigate the issue, it would have to be a drastic configuration change. The Security Team strongly recommends that the best solution is for sites to upgrade. The issue was identified by Jasper Mattsson (Jasu_M) as part of general research into the security of Drupal. Jasper works for Druid who provide a variety of services including security audits of Drupal sites. Over the years, security issues in Drupal have been found a variety of ways including researchers with personal motivation and through paid penetration tests or security audits. Drupal site owners concerned about security are encouraged to hire security firms to review their site. What could an attacker do on a vulnerable site? A successful exploit of the vulnerability can have a dramatic impact on the site. See the description of the risk score for details. Is the issue being exploited? Exploits have been developed. Sites not patched by Wednesday, 2018-04-11 may be compromised. This is the date when evidence emerged of automated attack attempts. It is possible targeted attacks occurred before that. Simply updating Drupal will not remove backdoors or fix compromised sites. Site builders should therefore update their sites immediately and then investigate to see if their site was compromised, perhaps following the guide for fixing a compromised site. See Drupal Core - Highly Critical - Public Service announcement - PSA-2018-002. My site has been hacked, what should I do now? Whether it was exploited via this issue or some prior issue, there is a general guide for "hacked" sites. I manage a Drupal 6 site, is a fix available? Yes, Drupal 6 is also affected and the Drupal 6 Long Term Support project has patches available. What other security measures might I put in place to improve my site's security. The Security Review which looks for weak configurations. 2 Factor Auth to improve the security of logins. Password Strength which helps enforce stronger passwords. Paranoia which provides a mix of tools to increase the security of sites. I manage a Drupal 8.0/8.1/8.2 site, is a fix available? Previous minor versions of Drupal 8 are not supported after a new minor release is created. If your site is currently on a Drupal release prior to 8.3.8, there are other disclosed security vulnerabilities that may affect your site. For this reason, you should immediately update to at least Drupal 8.3.9 or 8.4.6, then plan to update to Drupal 8.5.1 or higher within the next month. I can't update my site, what can I do to mitigate the problem? There are several solutions, but they are all based on the idea of not serving the vulnerable Drupal pages to visitors. Temporarily replacing your Drupal site with a static HTML page is an effective mitigation. For staging or development sites you could disable the site or turn on a "Basic Auth" password to prevent access to the site. This FAQ may be updated and any updates will be summarized here. 2018-04-13 Updated risk score per Drupal Core - Highly Critical - Public Service announcement - PSA-2018-002 and updated for exploits. When planning a PHP version to upgrade, consider that PHP 7.2 was released on November 30, 2017 and will remain supported longer than older PHP 7 versions. Why is support being dropped for PHP 5.5 and 5.6? PHP 5.5 has already reached official end-of-life in 2016. Following that, a growing number of the PHP libraries used by Drupal 8 have also started to discontinue support for PHP 5.5. PHP 5.6 stopped receiving active support from PHP maintainers in January 2017. This means that it is no longer receiving bugfixes, even for some very serious bugs that impact Drupal development. PHP 5.6 is the final PHP 5 version, so the PHP maintainers are providing two years of security fixes for PHP 5.6 beyond its active support, through December 2018. This is a few months after Drupal 8.6's scheduled release and well before Drupal 8.7 would be released. Drupal 8's automated tests require the PHPUnit library, which will drop support for PHP 5.6 in February 2018. Several other third-party dependencies are also dropping PHP 5.6 support in their latest versions. To minimize disruption for both Drupal users and Drupal developers, Drupal 8's support of PHP 5.5 and PHP 5.6 will end at the same time. We understand that upgrading from PHP 5 to PHP 7 may require time to plan and deploy. We suggest upgrading to PHP 7 in 2018 (rather than waiting for Drupal 8.7.0’s release). What if I'm using a hosting service that doesn't offer PHP 7? A majority of PHP hosting providers already offer PHP 7. If you're using one that doesn't, we suggest asking that provider when they will make it available, and if it's not until after March 2019, leave a comment on our tracking issue linking to that hosting provider, so that we can better understand the outliers, and perhaps offer some help. What if I'm at an organization that maintains its own hosting, and we're using Ubuntu 14.04, which bundles PHP 5.5? The preferred option is to plan an upgrade to Ubuntu 18.04 (to be released on April 2018, 2018). This version will be the most future-compatible. Another option is to upgrade Ubuntu 16.04, which is available now. You may need to upgrade Ubuntu again in a couple years if you choose to upgrade to 16.04 now. Finally, you can choose to upgrade to a separate build of PHP. Ondřej Surý provides a widely used PPA for doing this. When will Drupal 8 drop support for PHP 7.0? Support for PHP 7.0 will continue until at least March 6, 2019. We do not yet know whether Drupal 8's PHP 7.0 support will continue past that date, but we will post another announcement as soon as the end of PHP 7.0 support has been scheduled. We recommend you update to PHP 7.1 or higher since those versions will be supported longer. How does this affect Drupal 8 core development? Currently PHPUnit 6 is only used by automated test suite when it is running on PHP 7.2. PHPUnit 4 is used on PHP 5-7.1. In Drupal 8.8.x, support for PHPUnit 4 will be removed. At some point before 8.8.x it is likely that PHP 7.0 and 7.1 will use PHPUnit 6. Does this affect Drupal 7? No. Drupal 7 remains compatible with PHP 5.2.4 and higher. A separate announcement will be issued if and when that changes. Drupal 8.5.0, the next planned minor release of Drupal 8, is scheduled for Wednesday, March 7, 2018. Minor releases include new features, usability improvements, and backwards-compatible API improvements. Here's what this means now for core patches. The goal of the alpha phase is to begin the preparation of the minor release and provide a testing target for theme or module developers and site owners. Alpha releases include most of the new features, API additions, and disruptive changes that will be in the upcoming minor version. The 8.6.x branch of core has been created, and future feature and API additions will be targeted against that branch instead of 8.5.x. All outstanding issues filed against 8.5.x will be automatically migrated to 8.6. All issues filed against 8.4.x will then be migrated to 8.5.x, and subsequent bug reports should be targeted against the 8.5.x branch. Most issues that are allowed for patch releases will be committed to 8.5.x and 8.6.x. Most issues that are only allowed in minor releases will be committed to 8.6.x only. A few strategic issues may be backported to 8.5.x, but only at committer discretion after the issue is fixed in 8.6.x (so leave them set to 8.6.x unless you are a committer), and only up until the beta deadline. The release candidate phase will begin the week of February 21, and we will post further details at that time. See the summarized key dates in the release cycle, allowed changes during the Drupal 8 release cycle, and Drupal 8 backwards compatibility and internal API policy for more information. Using https://github.com/mozilla-services/react-jsonschema-form as a way to generate React forms without requiring developers to learn React. Possible replacement for Form API. Is this something that seems viable / a good idea? The way they use JSON schema is valuable; not necessarily the implementation. Explore separate react-ui and react-json-schema. tim.plunkett has code locally for the schema piece and will post a patch. What's the next UI after dblog? What are the next steps around the React DBLog prototype + component ui library, json schema forms? Do we want to actually add a new dblog to core or is it solely for an experiment? You can also read the full meeting transcript. New Drupal 8 committer: Francesco Placella! Italy and Italian Drupal Community are proud of this contribution, well deserved! Thank you for all you do (and will do), plach! A great pride for Italy! Complimenti France' :) Well done! Let me know when we could meet in Italy. The TWG coding standards committee is announcing two issues for final discussion. Feedback will be reviewed on 10/31/2017. Disallow assignments in conditions - This is controversial and could use more feedback. Explicitly disallow yoda conditions - This issue is postponed on the assignments newly announced above. DrupalCon Vienna includes a full track of core conversations where you can learn about current topics in Drupal core development, and a week of sprints where you can participate in shaping Drupal's future. Also be sure to watch Dries' keynote for ideas about Drupal's future! The TWG coding standards committee is announcing two issues for final discussion. Feedback will be reviewed on 9/19/2017. Prefer || or && Over or or and in Logical Operators - this issue needs more support in order to be ratified. The release candidate phase for the 8.4.0 minor release begins the week of September 4. Starting that week, the 8.4.x branch will be subject to patch release restrictions. Closer to the 8.4.0 release on October 4, we will limit the changes to critical bugfixes and other high-priority changes. You can help by ensuring that the issue priority is set correctly for major-priority issues, and that the branch field is set to 8.5.x (for disruptive changes) or 8.4.x (for patch-release-safe bugfixes) as appropriate. 8.4.0 provides stable, production-ready releases for several modules that were previously experimental, including Workflows, Datetime Range, Layout Discovery, Media, and Inline Form Errors. The release also includes several critical bug fixes and many other improvements for REST, content moderation, authoring experience, performance, and automated testing. You can read a detailed list of improvements in the announcement of alpha1. Minor versions may include changes to user interfaces, translatable strings, themes, internal APIs like render arrays and controllers, etc. (See the Drupal 8 backwards compatibility and internal API policy for details.) Developers and site owners should test the release candidate to prepare for these changes. 8.5.x will remain open for new development during the 8.4.x release candidate phase. Drupal 8.4.0 will be released on October 4th, 2017. September 6 is also a monthly core patch (bug fix) release window for Drupal 8 and 7, but no patch release is planned. This is also the final bug fix release window for 8.3.x (meaning 8.3.x will not receive further development or support aside from its final security release window on September 20). Drupal 8 sites should plan to update to Drupal 8.4.0 on October 4. For more information on Drupal core release windows, see the documentation on release timing and security releases, as well as the Drupal core release cycle overview. After consultation with the various initiative teams + core committers, we have created a DRAFT of proposed product goals for Drupal 8.5 (feature freeze: January 29, 2018) and Drupal 8.6+ (date TBD; ~late summer 2018). 2017 so we can hit the ground running in DrupalCon Vienna! Experimental modules that have alpha stability will only be committed to development branches of Drupal 8. Once an experimental module reaches beta stability, we now require (a) upgrade paths, and (b) backwards compatibility (or a deprecated BC layer) for any API improvements. For example, if an initiative team wanted to add a new experimental module to core for their desired feature, they could introduce a patch that met the requirements for an experimental module and it could be committed to 8.5.x as an alpha-stability experimental module. However, by 8.5.0-alpha1 (the week of January 17, 2018), either the module would need to be in "beta" level stability (which means its API and data model would be considered stable, with upgrade paths and API BC layers provided when needed), or it would be left in the 8.6.x branch, but removed from the 8.5.x branch before tagging the alpha. 8.5.0 would ship without this new functionality, but (if completed in time) it could be available in the 8.6.0 release. These policy changes are intended to address a number of frustrations with the existing experimental module process and to better meet expectations for non-core site builders and developers. For background on this decision or to provide your feedback, see the core policy issue that discusses this proposed change. The issue is open for community feedback until September 6, 2017. Thank you in advance! The monthly security release window for Drupal 8 and 7 core will take place on Wednesday, August 16. This does not mean that a Drupal core security release will necessarily take place on that date for any of the Drupal 8 or 7 branches, only that you should watch for one (and be ready to update your Drupal sites in the event that the Drupal security team decides to make a release). Drupal 8.4.0-beta1 will also be released sometime during the week to continue preparation for the upcoming minor release in October. There will be no bug fix or stable feature release on this date. The next window for a Drupal core patch (bug fix) release for all branches is Wednesday, September 06. The next scheduled minor (feature) release for Drupal 8 will be on Wednesday, October 5. For more information on Drupal core release windows, see the documentation on release timing and security releases, and the discussion that led to this policy being implemented. The monthly core patch (bug fix) release window is this Wednesday, August 02. Drupal 8.3.6 will be released with dozens of fixes for Drupal 8. Drupal 8.4.0-alpha1 will also be released sometime during the week to begin preparation for the upcoming minor release in October. There will be no Drupal 7 bugfix release this month. To ensure a reliable release window for the patch release, there will be a Drupal 8.3.x commit freeze from 12:00 UTC Tuesday to 12:00 UTC Thursday. Now is a good time to update your development/staging servers to the latest 8.3.x-dev code and help us catch any regressions in advance. If you do find any regressions, please report them in the issue queue. Thanks! To see all of the latest changes that will be included in the release, see the 8.3.x commit log. Starting in Drupal 8, we've added the notion of Experimental Modules, to help provide an early look at core features which are not yet complete. A major focus of Drupal 8.4.0 has been stabilizing these experimental modules, so that they can "graduate" to stable modules which can be installed in production and leveraged by other core and contrib modules. Here's a document that outlays the current status of each experimental module, as well as their goals with respect to the forthcoming 8.4.0 alpha deadline (which is this coming Monday, July 31). If you're looking for a productive way to help your favourite initiative during 8.4.0's alpha/beta/RC phase, check it out! Migrate / Migrate UI: Get as close to stable as possible. Symfony contacted the Drupal Security team about today's Symfony security release addressing an issue in UserPasswordValidator. This announcement is to reassure the Drupal community that Drupal 8 is not affected by this fix, as it does not make use of this security component. There is no Drupal 8 release scheduled for this, and there is no action you need to take on your Drupal site(s). Drupal 8.4.0, the next planned minor release of Drupal 8, is scheduled for Wednesday, October 4, 2017. Minor releases include new features, usability improvements, and backwards-compatible API improvements. Here's what this means now for core patches. The 8.5.x branch of core will be created, and future feature and API additions will be targeted against that branch instead of 8.4.x. All outstanding issues filed against 8.4.x will be automatically migrated to 8.5.x once it is opened. All issues filed against 8.3.x will then be migrated to 8.4.x, and subsequent bug reports should be targeted against the 8.4.x branch. Most issues that are allowed for patch releases will be committed to 8.4.x and 8.5.x. Most issues that are only allowed in minor releases will be committed to 8.5.x only. A few strategic issues may be backported to 8.4.x, but only at committer discretion after the issue is fixed in 8.5.x (so leave them set to 8.5.x unless you are a committer), and only up until the beta deadline. The release candidate phase will begin the week of September 4, and we will post further details at that time. See the summarized key dates in the release cycle, allowed changes during the Drupal 8 release cycle, and Drupal 8 backwards compatibility and internal API policy for more information. Help is most welcome with issues on the roadmaps for the linked modules now for a great Drupal 8.4.0! The monthly core patch (bug fix) release window is this Wednesday, July 05. Drupal 8.3.5 will be released with dozens of fixes for Drupal 8. There will be no Drupal 7 bugfix release this month. The monthly security release window for Drupal 8 and 7 core will take place on Wednesday, June 21. There will be no bug fix or stable feature release on this date. The next window for a Drupal core patch (bug fix) release for all branches is Wednesday, July 05. The next scheduled minor (feature) release for Drupal 8 will be on Wednesday, October 5. Several key contributors to the Migrate Initiative will be at the sprint at DrupalCamp Montreal on Sunday (and to some degree on earlier days as well). Join contributors Adam G-H (phenaproxima), Maxime Turcotte (maxocub) and Dave Vasilevsky (vasi) in person. Initiative coordinator Mike Ryan (mikeryan) is also planning to join remotely on Sunday. Among the most important Migrate critical issues on the table that are planned to be worked on is auditing for potential ID conflicts before upgrading from older versions. This is the most thorny outstanding issue for the initiative. Use cases and feedback in general is welcome. Further migrate issues are categorized and tracked in the Migrate triage spreadsheet (update regularly). These include handling import of private files, adding back support for incremental migrations, redirecting for obsolete content translations when they are merged in the migration, etc. All of those need helping hands and this is a great time to get experienced with help from the most well versed people in the field. If you cannot join the sprint this time, your involvement is more than welcome anytime. The migrate team has weekly meetings on every Thursday at alternating meeting times. See https://www.drupal.org/node/2735059#meet for the upcoming meetings. DrupalCamp Montréal is coming up this Thursday to Sunday (June 15th to 18th), with great trainings, two days of sessions, and a dedicated sprint day on Sunday. The sprint gives you a great opportunity to get involved and make a difference for the things that affect Drupal and your projects. You don't need to be an expert, developer, or existing contributor to get involved. Here are three current focus areas that we'll collaborate on on this week! Major issue triage sprints have been held at many DrupalCons and camps recently and Montréal will continue these efforts. We want to fix the most important bugs in Drupal, but the first step to that is making sure bug reports are up to date and actionable. That is where major issue triage helps: identifying reports that should be critical, closing ones that are no longer relevant, downgrading ones that are actually less severe, and making sure relevant reports can move forward to a fix. Sometimes just asking questions for clarification on bug reports will move things ahead a lot. Still not convinced this sprint is for you? Read more in my blog post from earlier this year. We made several changes in the release process with Drupal 8 to make Drupal upgrades easy forever. One of them is that we improve Drupal's APIs in scheduled six-month minor releases, but also leave the old ways of doing things in place and mark them as deprecated until Drupal 9. This huge shift for Drupal allows module maintainers to adapt to changes gradually, on their own schedule, instead of needing a massive push all at once on some later release date. API deprecations are documented in change records on Drupal.org, and also marked directly in the code documentation. We started marking deprecated code almost two years ago as we were preparing to release Drupal 8.0.0, and we have been creating change record documentation since the release of Drupal 7. Unfortunately, we did not start to connect the two until recently, so it was not possible to read more about a certain change when you encountered a deprecated API. Help make these connections for an easier upgrade path for everyone. As we mentioned above, Drupal 8 has 6-month minor releases that improve APIs (as well as adding new features). In order to make this safe, clear, and maintainable, we defined what parts of Drupal's APIs are internal through a documented policy, but that is not very explicit for developers. Making this explicit in code documentation is more effective for anyone reading the code or developing with an IDE. By helping with this effort, you can learn a lot about Drupal 8 APIs and help with the upgrade path through documenting a better-defined API surface. Also, help me help sprinters! I'll be in the Montréal sprint room all four days of the camp to work with potential contributors and show them how to help with these tasks, but I could use some help myself. If you have experience with Drupal 8 (even a little) or have past experience sprinting on major triage or mentoring at Drupal events, please ping me. Helping others is an especially important way to contribute back. On that note, many thanks to camp organizers for making these sprints possible. À jeudi! See you at the camp! Thanks to Gábor Hojtsy for help with this post. New Drupal 8 Committer: Lee Rowlands! WOW, Congrats larowlan this is super amazing. So happy that a co-worker and fellow Australian has been given this responsibility. Could not come to a more deserved person. Like all other core contributors, I really appreciate that you're taking on this responsibility. Thanks and congratulations. Congratulations, and thank you! Looking forward to working with you more than we already did in the past! The monthly core patch (bug fix) release window is this Wednesday, June 07. Drupal 8.3.3 and 7.55 will be released with fixes for Drupal 8 and 7. To ensure a reliable release window for the patch release, there will be a Drupal 8.3.x commit freeze from 12:00 UTC Tuesday to 12:00 UTC Thursday. Now is a good time to update your development/staging servers to the latest 8.3.x-dev or 7.x-dev code and help us catch any regressions in advance. If you do find any regressions, please report them in the issue queue. Thanks! To see all of the latest changes that will be included in the releases, see the 8.3.x commit log and 7.x commit log. Midwest Developer Summit 2017-08-11 -- 2017-08-13 -- Register Now! Make your plans to join us for the Drupal Midwest Developer Summit, August 11-13, on the University of Michigan campus, in Ann Arbor MI. Join us for 3 days this summer in Ann Arbor, Michigan, for the 2017 Midwest Drupal Summit. For this year’s Summit, we’ll gather on the beautiful University of Michigan campus for three days of code sprints, working on issues such as porting modules and writing, updating documentation and informal presentations. We will start around 10AM and finish around 5PM each day. Lunch, Coffee and Snacks will be provided each day. What’s New This Year at MWDS? Relaxed, low-key sprinting and socializing with Drupal core contributors and security team members. An opportunity to learn from Drupal core contributors and mentors, including Angie “webchick” Byron, Michael Hess, Peter Wolanin, Neil Drumm and xjm. Code sprints. Let’s clear out some queues! Help Porting modules to Drupal 8. Good food and good community. Ann Arbor is about 30 minutes by car from Detroit Metro Airport. Ann Arbor is also served by Amtrak. The important first step for media support in core just landed in Drupal 8.4.x: a new beta experimental Media module to support storing media of various types. While Drupal core already has generic file upload and image upload support, the new module will support asset reuse and be extensible to support video, remote media, embedding, and so on. That said, this is just the first step. (If you go and enable the core Media module, all it can do right now is give you an error message that no media types can be created.) The next steps are to add a file/document media plugin and an image media plugin so these types of media may be created on the site with the module. Then, widgets and formatters for the upload field and image field interfaces will be added so we can reproduce the existing core functionality with media. Adam Hoenich wrote up a concise summary of the next steps, and granular details are listed in the followup roadmap. There are definitely more tasks than people available, so your contributions would be more than welcome! Now is the time to make sure media is integrated in a way that your projects can best utilize it. Get involved through the media IRC meetings happening at 2pm GMT every week in #drupal-media. (See https://www.drupal.org/irc for more information on Drupal IRC). Or, if you are available at other times, ask in the channel. The issues are listed on the Media Initiative plan. Let's put the remaining pieces in place together! The monthly security release window for Drupal 8 and 7 core will take place on Wednesday, May 17. There will be no bug fix or stable feature release on this date. The next window for a Drupal core patch (bug fix) release for all branches is Wednesday, June 07. The next scheduled minor (feature) release for Drupal 8 will be on Wednesday, October 5. The monthly core patch (bug fix) release window is this Wednesday, May 03. Drupal 8.3.2 will be released with dozens of fixes for Drupal 8. There will be no Drupal 7 bugfix release this month.